Risk is broadly defined as the probability of actions or a certain function that may result in unfavorable consequences. Almost every human action is accompanied with a certain degree of risk, while some actions are more risky. In financial literature, risk is defined as unexpected events manifested in the form of change in asset of liability values. Risks cannot be eliminated completely but can be lowered to a tolerable or acceptable level. Thus, the goal of risk management is to provide a consistent framework for identification, evaluation, elimination, control, prevention, attenuation, and announcement of the risks. Every institution is threated by health, safety, and environment (HSE) risks. This is also the case for hospital as a servicing body which deals with people's health and faces various HSE risks. Considering the crucial role of hospitals in human health, their HSE risks should be carefully investigated. HSE risk and their reaching to critical level is a major concern in hospitals that threatens citizens' health. Thus, there is a global attempt to combat this phenomenon through implementing long-term actions. In microscale, local pollutions whose impacts range from simple troubles to dangerous diseases are considered by responsible bodies. Other issues at global level are of greater importance. This makes HSE risks major challenges for hospitals. In modern society which is based on interwoven systems, a small disruption is a certain systems is followed by disturbance in other systems and may even create a threat for environment and whole the society. Therefore, everyone seeks for a low-risk and safe system. Hazard is an indispensable part of life and cannot be eliminated entirely but can be minimized. Health-care actions are also accompanied with risk. Here, risk refers to uncertainty and probability of occurrence with a certain severity. Risk evaluation reveals how much damage and which environmental consequences are imposed by each hazard. According to the International Standard Organization, risk shows accident probability and its consequences. Health-care organizations are responsible for providing services to clients and a safe environment for patients and employees. In this regard, risk identification programs enhance the effectiveness and efficiency of such services. Necessity for risk management programs in clinical, diagnostic, and other actions of hospitals has been emphasized by many authors. Hospital safety has economic, humanitarian, and ethical importance and risk management is practiced in hospitals to reduce the occurrence and spread of preventable events. Risk management plays a strategic role in presenting and reporting medical errors. Risk management is a tool to improve medical services in hospitals and medical centers. It is necessary that hospitals evaluate their employees' familiarity with risk management and implement risk management practices, especially in clinical sections. Much attention has been paid to medical cares during recent years as a result of changes in life standards and growing demand for medical cares for improving lifestyle. Safety risk of hospitals represents a major challenge for health system of every country which threatens patients' safety. Thus, it is critical to identify and prioritize such risks in order to make intervention policies. Although there is a consensus about the importance of HSE risks in hospitals, the major point in managing such risks is identification and prioritization of HSE risks based on which both short- and long-term actions can be developed stated that HSE management is not possible without considering different aspects of risks. Thus, the present study aims at finding answer for the following questions: what are the main risks in Loghman hospital? How much is the weight and importance of HSE risks in Loghman hospitals? HSE risks represent a major class of risks in sustainable development, environmental management, industrial management, and ecological studies. The importance of these risks has been more highlighted, particularly during recent years due to increased concern about environmental pollution, used failure mode and effect analysis (FMEA) method to evaluate risks of the sustainable supply chain. For this purpose, 30 environmental, social, financial, and economic risks were extracted from the relevant literature. The authors reported that internal environmental risks such as production of greenhouse gases had the highest importance evaluated various aspects of HSE risks and found out that a combination of economic, social, and biological factors plays a role in formation and severity of HSE risks. The authors proposed some recommendations such as following sustainable development, socioeconomic consideration, and risk evaluation. Selck et al. (2017) conducted a descriptive study on HSE risks and concluded that these risks are not only determined by combination biological, social, cultural and economic factors but also their consequences includes social, biological, and economic problems. The authors proposed individual strategies for preventing from environmental pollutions as an effective solution for the reduction of HSE risks. On the other hand, HSE risks are of special importance in hospitals due to their particular nature. Investigated HSE risks in two hospitals of Romania and found out that environmental risk in these hospitals has reached critical level and soil and air pollution is a major problem in these areas. Studied HSE risk of hospitals and found out that soil pollution is high in these regions and may cause numerous problems for hospital employees and neighbors. Investigated environmental pollutions in Spain hospitals and concluded that the soil of these regions is highly polluted and hospital wastes threaten children's life. In a similar work, reported high degree of water and soil pollution in regions neighboring Jiangsu hospitals and water pollutants creates major health problems for residents of adjacent areas. Investigating HSE risks in Australian hospitals concluded that heavy metal concentration in the soil of these areas is higher than permissible threshold that may cause health problems in long-term for people who live in adjacent regions. López-Mestanza et al. (2018) have studied about clinical factors influencing mortality risk in hospital-acquired sepsis. This study identifies several major factors associated with mortality in patients suffering from HAS. Implementation of surveillance programmers for the early identification and treatment of sepsis translate into a clear benefit. Maia et al. (2018) have studied about undernutrition risk at hospital admission and length of stay among pulmonology inpatients. Yousefi et al. (2018) have studied about HSE risk prioritization using robust data envelopment analysis (DEA)-FMEA approach with undesirable outputs. The proposed approach was implemented in a company active in manufacturing spare parts of automotive and then results were compared to conventional DEA model and risk priority number (RPN) scores. The results indicate that ranking risks according to this extension compared to traditional FMEA, leads to a more reliable and convincing prioritization. Maia et al. (2018) have studied about undernutrition risk at hospital admission and length of stay among pulmonology inpatients. Pulmonology inpatients with high undernutrition risk had a longer length of hospital stay and had a lower probability of being discharged to home. In particular, lung cancer patients had a lower probability of being discharged to home, which corroborates a worse prognosis for these patients. Krumholz et al. (2017) have studied about hospital-readmission risk – isolating hospital effects from patient effects. The result shows that when the same patients were admitted with similar diagnoses to hospitals in the best-performing quartile as compared with the worst-performing quartile of hospital readmission performance, there was a significant difference in rates of readmission within 30 days. The findings suggest that hospital quality contributes in part to readmission rates independent of factors involving patients. Dubale et al. (2017) have studied about FMEA of intravenous-medication process in hospitals. Based on the findings of this study, 57 potential failure modes in four key processes of the studied neonatal Intensive Care Unit (ICU) were determined, among which 27 potential errors and failures with high risks were recognized. Therefore, it can be suggested that the senior managers and administrators should create multidisciplinary teams for patient safety at the organizational and unit levels. Dağsuyu et al. (2016) have studied about classical and fuzzy FMEA risk analysis in a sterilization unit. They assess and identify the hazards discussed in prior studies and new hazards discovered during this study. The method proposed in this study provided both accurate risk assessments and effective responses to those risks. Finally, a case study of the sterilization unit of a large hospital is presented to demonstrate the effectiveness of the proposed methods. As whole, previous studies highlight the importance of HSE risks and reveal that soil and water pollution exacerbate such risks in adjacent areas. Under this condition, it is necessary to identify and prioritize HSE risks so that major hospital risks can be managed in better manner. Considering the cost and time-consuming of this research, a study has not been carried out in this area in Tehran hospitals. In this research, for the first time in Iran, we identified the risks and hazards of hospitals based on the FMEA technique and risk management. The strength of this research is that the risk assessment team was able to assess and manage all the potential and actual risks in the hospital. The weakness of this research is the lack of necessary collaboration between the hospital staff. 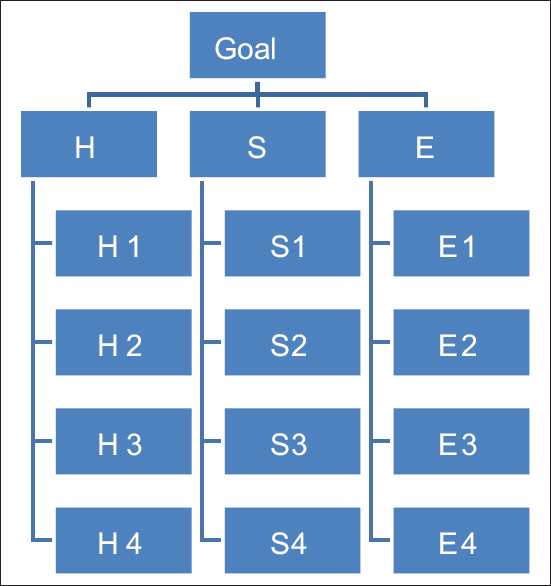 The present study was conducted to identify HSE risks and aspects in Loghman hospital and manage them using analytical hierarchy process (AHP) technique. The research was carried out in Loghman Hakim hospital during 2016 summer to 2017 spring. This is an applied research conducted as a descriptive survey. Data were collected using FMEA checklist and pair-wise comparison questionnaire. FMEA was used for the identification of risk management and AHP technique was applied to prioritize the final risks. Using this hybrid approach, five points were selected out of the large number of risks for further analysis. Statistical population includes employees of the hospital (n = 68). Regarding finite nature of the population, no sampling was performed and analysis was conducted by census. Individuals were selected based on familiarity with workplace, awareness about environment hazards and at least 5 years of job experience. In this study, expert is one who has academic degree in HSE (at least MA degree), at least 10-year experience in hospital HSE and 5-year experience as HSE manager. Data were collected using checklist, observation, interview, and document. 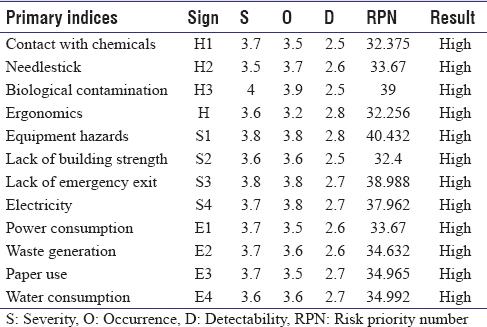 Acceptable and unacceptable value of the risks was estimated using tables indicating their severity, probability, and detectability according to the HSE aspects. Ten experts participate in AHP technique. Hybrid AHP-FMEA approach has been used in other studies as well. General model of the hybrid approach is presented in [Figure 1]. Research procedure is described in following sections. 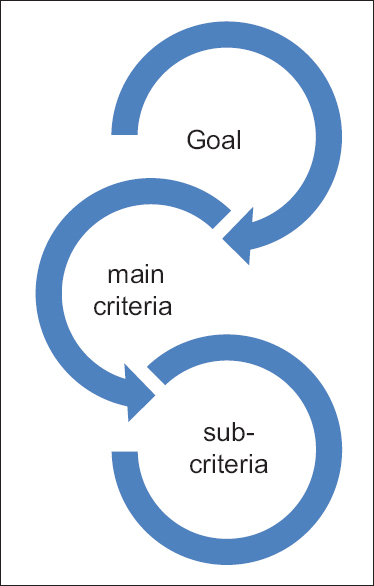 In the first phase of the research, FMEA technique was used to screen, combine, and identify the main criteria. RPN index was used as the criterion for determining elements' weights. In FMEA, RPN is used as an index to classify the errors and taking preventive actions. Error states are prioritized based on their RPNs. The higher the RPN value, the higher the element's priority for analysis, and resource allocation. Severity (S), occurrence (O), and detectability (D) of the risks were estimated to determine HSE risks' weights by FMEA. The experts were asked to determine S, O, and D of each risk using a four-point scale. Hazard is potentially present in every action taken in hospitals. Thus, legal requirements of HSE related to operational activities in hospitals were identified. Then, field visits were performed and risk identification and evaluation checklists were completed individually in two safety–health and environment sections. Standards, legal, and other requirements. Indices placed in low-risk level are eliminated. AHP technique was developed by Saaty. In this research, main criteria and corresponding components of each criterion were prioritized by pairwise comparison using 9-point scale developed by Saaty. Verbal expressions were scaled as presented in [Table 1]. The present study was carried out in Loghman hospital. The hospital is located in a 19,000 m2 areas with foundation of 29,440 m2 that is formed by 8 buildings in 4 and 6 floors, outdoor and indoor parking together with motorcycle and ambulance station. The hospital has two eastern and northern gates, 420 registered beds and 76 star beds, 24 hospital sections, 14 parking units, 33 clinics and special centers for research and development, poisoned, infectious, and tropical diseases that serve as scientific fields. Poisoned center act as the scientific hub for poisoning researches. Five points were selected and their HSE risks were evaluated and their risk management was investigated using AHP technique. These five points include laboratory, endoscopy, ICU, visit room, and water closet. HSE risks were rated after identification. The main risks include HSE risks, for which some indices were assigned. The results of FMEA regarding the final evaluation of the risks are presented in [Table 2]. The corresponding AHP graph is depicted in [Figure 3]. Main criteria were compared pairwise. At first, experts' comments were collected using Saaty's 9-point scale. Then, experts' comments were aggregated through estimating geometric mean and used for the calculation of final weights of the criteria. Pair-wise comparison matrix was set based on geometric mean of experts' comments. Normal weight is achieved by dividing geometric mean of each row by the sum of geometric means of all rows which is called eigenvalue. Summary of the results is presented in [Table 3]. Safety criterion with normal weight of 0.467 had the highest priority, followed by health with normal weight of 0.353 which had the intermediate priority. Environmental criterion with normal weight of 0.180 had the lowest priority (The results are shown in [Figure 4]). Inconsistency rate was estimated close to zero (<0.1), suggesting reliability of the results. Subcriteria were compared in similar way whose output is represented in this study as W2. To estimate final weights of the indices, weight of each index (W2) is multiplied by that of main criteria (W1). Super decision software was used to perform the calculation process. Final priority of the criteria is presented in [Table 4]. According to the results, lack of emergency exit with normal weight of 0.143 has the highest priority, followed by lack of building strength (normal weight of 0.114), electricity (0.113), and biological contamination (0.107). At the end of the research, some recommendations are proposed for HSE field based on risk identification (FMEA) and risk prioritization (AHP). Regarding safety issue, Loghman hospital lacks emergency exit due to old nature of the building which causes a serious threat for both hospital and people. An emergency exit gate can be constructed for each floor that can be used in emergency events, and hence, minimize the estimated risk. Considering low strength of the building due to its old nature, the hospital can be reconstructed through a sophisticated engineering plan. At first, this proposal may not be suitable owing to high cost; however, much higher cost will be imposed if a disaster occurs. Fire alarm and extinguishing system should be installed in each section so that when a fire occurs, the employees and managers get aware quickly; thus fire consequences can be minimized. Regarding potential hazards of the equipment, the electricity generated by devices can cause electrocution or electric shock. Moreover, contaminated surfaces of the device may cause diseases transmission which is an indispensable fact. According to abovementioned notes, hospital management can replace the existing devices with modern ones and minimize electricity risk by implementing earth well. Moreover, on time replacement of disposable things, sterilization, calibration, and use of devices according to manufacturer's instruction not only promote usable life of the device but also lower biological risk. Regarding health index, biological contamination represent an inevitable issue in medical centers which play critical role people's life. The main practice to prevent from transmission of such contaminations is to apply personal protection tools that prevent from pollution and contamination transmission. Regarding ergonomics, it is suggested that employees be trained with sufficient education about accurate sitting and using computer, ergonomic table and chairs because nonergonomic equipment may impose long-term damages on employees' bodies. It is recommended to use air conditioning and ventilation to avoid damaging effects of chemicals inhaled through nose and mouth. Moreover, employees should use personal protecting tools. Being needle stick is a major issue in health section because blood may enter bodies directly and cause acute and viral diseases. Rescuing such risk is obtained by increased focus during the work and using personal protection instruments. Regarding environmental issues, high-power consumption was observed that can be reduced. Application of standard low-consumption lights, turning the device off when not used, turning the lights off, and educating the employees about the reduction of power consumption, proportional job, and employees education may be effective way to reduce power consumption. Obviously, various dry, wet, infectious wastes, and blood products are generated in medical centers but can be collected and buried to prevent from environmental pollutions. Separating different garbage and putting them in special closed bins designed for rubbish carrying may reduce this risk. Amegah AK, Agyei-Mensah S. Urban air pollution in sub-Saharan Africa: Time foraction. Environ Pollut 2017;220:738-43. Cagnin F, Oliveira MC, Simon AT, Helleno AL, Vendramini MP. Proposal of a method forselecting suppliers considering risk management: An application at the automotiveindustry. Int J Q Reliab Manag 2016;33:488-98. Dağsuyu C, Göçmen E, Narlı M, Kokangül A. Classical and fuzzy FMEA risk analysis in asterilization unit. Comput Ind Eng 2016;101:286-94. Slamet AS, Nakayasu A, Astuti R, Rachman NM. Risk assessment of papaya supplychain: An Indonesian case study. Int Bus Manage 2017;100:508-21. Dubale S, Suleman S, Gurmesa A. Failure mode and effect analysis (FMEA) of IV-medication process in Mettu Karl hospital, Mettu town, Oromiya regional state, South West Ethiopia. Clin Res Open Access 2017;3:14-22. Torres B, Palacoos V, García S, López JJ, Gómez E, De Luis DA. SUN-P134: Nutritionalrisk assesment in atertiary hospital. Clin Nutr 2016;35:S93-4. Noel VM, Omega RS, Masbad JG, Ocampo L. Supply input-output economics in processprioritisation of interdependent manufacturing systems. Int J Manage Decis Mak 2017;16:1-23. Gabarrón M, Faz A, Martínez-Martínez S, Zornoza R, Acosta JA. Assessment of metalsbehaviour in industrial soil using sequential extraction, multivariable analysis and ageostatistical approach. J Geochem Explor 2017;172:174-83. Giannakis M, Giannakis M, Louis M, Louis M. A multi-agent based system with big dataprocessing for enhanced supply chain agility. J Enterp Infor Manage 2016;29:706-27. Guneri AF, Gul M, Ak MF. Occupational health and safety risk assessment in hospitals: A case study using two-stage fuzzy multi-criteria approach. Hum Ecol Risk Assess Int J 2017;23:187-202. Jiang Y, Zeng X, Fan X, Chao S, Zhu M, Cao H, et al. Levels of arsenic pollution in dailyfoodstuffs and soils and its associated human health risk in a town in Jiangsuprovince, China. Ecotoxicol Environ Saf 2015;122:198-204. Siahpour G, Orak N. Study evaluation of environmental risk Ramin thermal powerplant using, DELPHI, AHP and FMEA methods in physicochemical environment. HumEcol Risk Assess Int J 2017;21:54-67. Krishna AK, Mohan KR. Distribution, correlation, ecological and health riskassessment of heavy metal contamination in surface soils around an industrial area, Hyderabad, India. Environ Earth Sci 2016;75:1-17. Krumholz HM, Wang K, Lin Z, Dharmarajan K, Horwitz LI, Ross JS, et al. Hospital-readmission risk – Isolating hospital effects from patient effects. N Engl JMed 2017;377:1055-64. Kuzmanović M, Ginebreda A, Petrović M, Barceló D. Risk assessment basedprioritization of 200 organic micropollutants in 4 Iberian rivers. Sci Total Environ 2015;503-504:289-99. Lam J. Enterprise Risk Management: From Incentives to Controls. United Kingdom: John Wiley and Sons; 2014. Selck H, Adamsen PB, Backhaus T, Banta GT, Bruce PK, Burton GA Jr., et al. Assessingand managing multiple risks in a changing world-theroskilde recommendations. Environ Toxicol Chem 2017;36:7-16. Mackay AK, Taylor MP, Munksgaard NC, Hudson-Edwards KA, Burn-Nunes L. Identification of environmental lead sources and pathways in a mining and smelting town: Mount Isa, Australia. Environ Pollut 2013;180:304-11. Mantoux P. The Industrial Revolution in the Eighteenth Century: An Outline of the Beginnings of the Modern Factory System in England. United Kingdom: Routledge; 2013. Martin IM, Martin WE. Understanding the risk mitigation decision: Homeowners andenvironmental risks. In: The Customer is NOT Always Right? Marketing Orientations in a Dynamic Business World. Cham: Springer; 2017. p. 402-5. Mendes R, Policarpo S, Fortuna P, Alves M, Virella D, Heyland DK, et al. Nutritional riskassessment and cultural validation of the modified NUTRIC score in critically illpatients – A multicenter prospective cohort study. J Crit Care 2017;37:45-9. Maia I, Xará S, Vaz D, Shiang T, Amaral TF. Undernutrition risk at hospital admissionand length of stay among pulmonology inpatients. Pulmonology 2018;14:108-19. Yousefi S, Alizadeh A, Hayati J, Baghery M. HSE risk prioritization using robustDEA-FMEA approach with undesirable outputs: A study of automotive parts industryin Iran. Saf Sci 2018;102:144-58. Dubale S, Suleman S, Gurmesa A. Failure mode and effect analysis (FMEA) ofIV-medication process in Mettu Karl hospital, Mettu town, Oromiya regional state, South West Ethiopia. Clin Res Open Access 2017;3:14-22. Saaty TL. How to make a decision: The analytic hierarchy process. Eur J Oper Res 1990;48:9-26. Saaty TL, Takizawa M. Dependence and independence: From linear hierarchies tononlinear networks. Eur J Oper Res 1986;26:229-37.